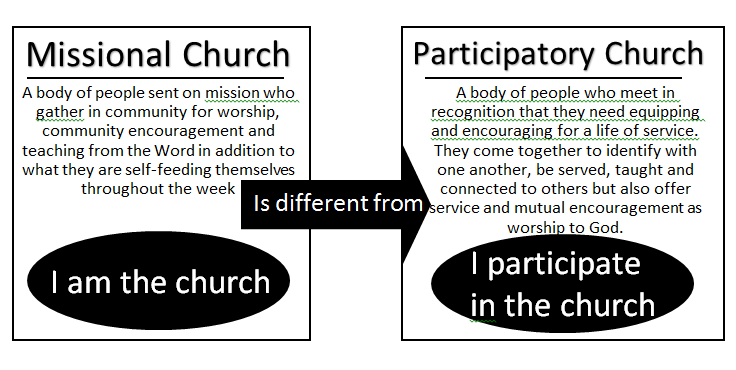 This week, I saw the above image shared on social media summing up the sentiment of many recent articles drawing a dichotomy between “consumer” and “missional” church structures. The basic argument is against a passive, ‘me-centric’ view of church and towards more active, self-starting, outward-facing approaches. I am in complete favour of encouraging Christians to actively contribute to and create Christian community. However, I worry that the lines in this debate are often clumsily drawn and oversimplified, serving to perpetuate poor discussion around the issue rather than progress towards the kind of participatory culture Paul urged the Corinthians to embody. At its heart, participating in anything is reciprocal i.e. two way – there has to be some level of receiving or ‘getting’, otherwise it’s not participation. Let’s say I am a left thumb. I participate directly in the action of pressing the space bar and holding a glass. I am happy to contribute my specifically designed joints and contours to make the action happen well. However, when the body needs to move across to the other side of the room to get my computer, as a thumb, my participation in the action is reduced to utter dependence on more skilled/ appropriate parts to get me into a position where I can be directly effective. The thumb’s contribution to the moving across the room has to be as a consumer, in effect, of the services of the other body parts. This submission to others’ contributions then brings the whole body to a place where the thumb can be effective itself. Equally, when we come together as church, participating requires some levels and (I would go as far as to argue, some seasons) of consuming – and that consumption is an intrinsic part of participating, so long as it is a stepping stone to better owning our own identity, skills and roles. By receiving from others, we not only benefit from their service but also release others to explore their own roles and shared community identity. The biggest challenge, to my mind, is committing to a view of church in which the Body of Christ is understood as more than just the sum of all its parts. Rather, it is important to understand that the Church and your church both have emergent properties – meaning that when we a selection of believers come together – God makes of us, something more than just the number of people present. It may help to think of a human being. When you add a brain to a skeleton, some muscles and organs – a person cannot be reduced to just a selection of bones and tissue. Personhood needs a much deeper explanation than this! We can’t and shouldn’t try to completely get away from the church as a ‘dispenser of religious good and services’ (as above) because there is a whole range of things that we can only do and be when we’re together. God designed it that way. Neither should this breed a laziness of reliance on the power of the corporate but let’s make sure we don’t lose sight of the sense in which the church is Christ’s unique and holy representation on earth – not just a group of loosely associated individuals with vaguely similar goals who happen to meet together for a good time. Formation is not just about individual actions , but patterns. Recent research is demonstrating that the brain’s plasticity is most deeply impacted not just by certain behaviours per se but by repeated patterns of behaviour; what the church might call creed or liturgy. So, we’re not really formed by consumption itself but rather by patterns of consumption and the associated cycles that draws us into. In other words, as long as regularly receiving from others and the church forms part of a cycle that spurs the believer into deeper vulnerability and generosity, an expectation to ‘take’ from church is not just ok but a necessary part of a healthy, missional church.